See the original story here. Gustav was not quite finished when I left for the Cossatot River. The skies were still overcast, a misty drizzle was falling and winds were still whipping through the trees. I almost always take back roads on my exploration trips. During inclement weather, this often means you encounter acts of nature that have not yet been addressed by those officials whose duty it is to fix what Mother Nature hath wrought. This was the case when I came across a couple of trees laying across the eastbound lane of the highway upon which I was traveling. Fortunately for me, the fallen giants had dropped across the other lane. Not quite thirty minutes later, close to Arkadelphia AR on Arkansas Hwy. 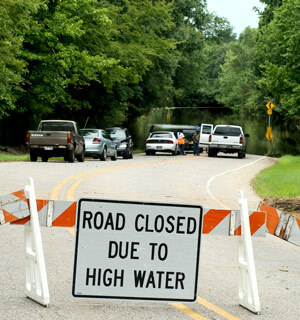 51, I had to turn back due to high water covering the road. Apparently, this was such a rare occurrence, folks decided to just stop and visit at the water’s edge. Though the conversation appeared to be lively, being anxious to get to the river, I did not stop to discover the topics being discussed. Hope that wasn’t a mistake. Exiting from the fording experience, I was still on a new route, one which I had never traversed before. I came upon a rural residential area which looked like a subdivision laid out with 40 acre or so plots. 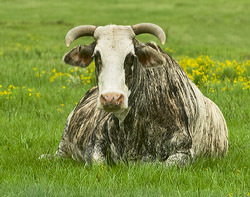 There was a large pasture inhabited by a herd of cows and one favored and fortunate bull. One of the cows was a bit out of the ordinary. She had not been dehorned and she was wearing a stylish brindle striped coat. She apparently was the queen of the herd. She watched me like a hawk and appeared to be nonchalant about being photographed. Perhaps even a little snooty. If you are the queen, I suppose being snooty goes with the territory. Glenwood AR, a pleasant town of 2,000 or so souls was my base camp. Having spent plenty of time sleeping on the ground and preparing food under primitive conditions, I have nothing left to prove along those lines. So I made arrangements to reside at the Riverwood Inn for a couple of days. The accommodations were very nice and the proprietors are most congenial. I recommend it heartily. It’s forty miles or so to the Cossatot River State Park, my target, from Glenwood. After the check-in routine, I headed west toward the Cossatot. The sky was still a bit overcast, and the section of the river with the falls is best shot it the morning. But my blood was boiling and I did an 80 mile round trip and fed the pickup its diet of gasoline anyway to see and hear the river at its best. I was not disappointed. However, due to shooting in the afternoon and in the wrong direction, the 200 or so shots I made that first day were nothing to get excited about, with one significant exception. The Arkansas Hwy 246 bridge over the Cossatot is something you would expect to see in the Alps or at least in the Rockies of Colorado. I can’t tell you for sure just how tall that sucker is, but I’m guessing, from a comparative standpoint, 10 to 12 stories. The bridge is supported by a single vertical truss. The view off the bridge is spectacular. Unfortunately, the bridge is two vehicular lanes with precious little space for a human being to stand and photograph what’s below. 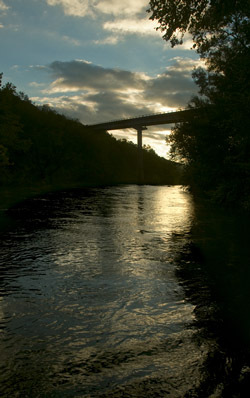 Fortunately, you can access the river, just downstream from the bridge via the state park visitors center. I caught the late afternoon sun through the bridge. Since the photo was shot with an extreme wide angle lens, the bridge does not look as high as it really is. After a good night’s sleep, I ventured forth the next morning enjoying a spectacular day. On the way, I mused to my self that Chuck Haralson, legendary and long-time photographer for the Arkansas Department of Parks and Tourism should be there. After all, the river was at its category V best on a glorious day. Little did I know that he was just minutes ahead of me on his way to the Cossatot. Did he ever. He had made arrangements with world-class paddlers Tommy Wingard, and Jason and Sabrina Mellor to shoot the rapids that day. Tommy, Jason and Sabrina, all Arkansans, are members of the Arkansas Canoe Club, a 500 member organization of canoe and kayak enthusiasts. These three have regularly negotiated some of the most difficult and dangerous class V streams for years. As most experts do, they made what would be suicidal for all but those of their skills, look easy. Chuck and paddlers confer before the next run. 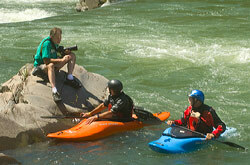 These kayakers are a cooperative sort. 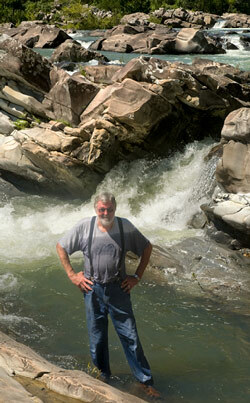 After shooting several of the rapids, they would calmly pull their boats up to the rock where Chuck was perched. They conducted impromptu conferences with Chuck on new approaches. Then, it was off to the races again. 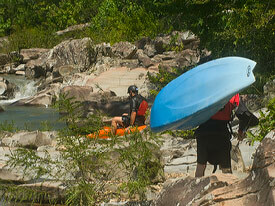 Kayakers portage their boats for another run. Yippee! Later, a couple of rafts came around the bend. After no small amount of reconnaissance and consideration, they shot the rapids and made their merry way down the river, sopping wet and grinning like a jackass eating saw briers. 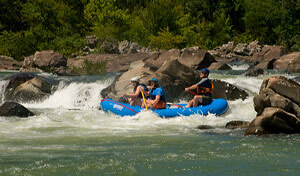 The Cossatot generates adrenalin and the rafters were apparently pumping a healthy dose just like the kayakers. 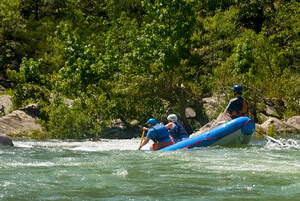 Rafters shoot the white water. Tired, but happy, we decided we had what we came for and it was time to make our way back over the rocks to our waiting vehicles. There was a problem looming. To get from the parking area to the prime shooting area, you have to negotiate some large, craggy rocks. This is by design. 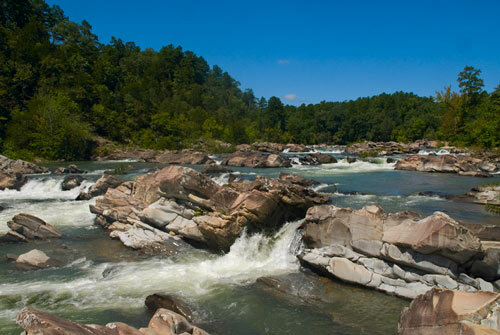 Unlike many state parks, where access to the sights is made easy by constructed paths and foot bridges, the Cossatot has been left in its natural condition. While I approve of this, it makes for an arduous and perhaps a bit dangerous passage to get where you need to be. To get to the last shooting setup, it was necessary to descend a rock nearly my height, just under 6-6.” It’s not a problem to get down the rock. You merely scoot down it on your backside. Getting back up the rock was another story. I made a step with my hands to give Chuck a boost. With that small bit of help, popped up the rock like mountain goat. Not so for me. Yours truly, wet and happy. After several furtive, grunting attempts, I knew it wasn’t going to happen for moi. On to plan B. I handed all of my gear and pocket contents to Chuck and proceeded to wade around the rock. 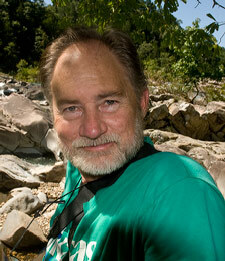 About midway through the wade, I was up to my chest in Cossatot. At the conclusion, Chuck shot me, still ankle deep in the water, wet and glad to be where I was — in one piece. We plodded on for what seemed to be an eternity, occasionally pausing to take a swallow or two of bottle water. Seems crazy to drink bottled water when 1,000 cubic feet per second of clean, pure mountain water is coursing past you just a few feet away. But in this case, discretion is the better part of valor. To access the river for a drink would probably result in an unceremonious dunk. Close to the parking lot, we stopped and talked over what we had done. Negotiated some difficult territory and watched and shot world class kaykers shooting rapids on one of the best class V stretches of water in the nation. Not just everyone gets to do that. We were grateful. Not a bad way to spend a day. The Cossatot rocks! Figuratively and actively. I’m forwarding this to my niece Nanci Ball Kinser, whose husband (in particular) has kayaked a many a breathtaking river. 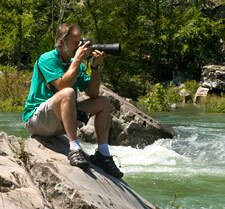 I’m sure he will enjoy seeing these pics of the Cossatot, right here in his wife’s li’l ole home state! It was good to see them again. I quiet stretch on a midlevel Buffalo River jaunt is the best we’ve ever done – and that was 12-15 years ago, but this is breathtaking, and good to see again.